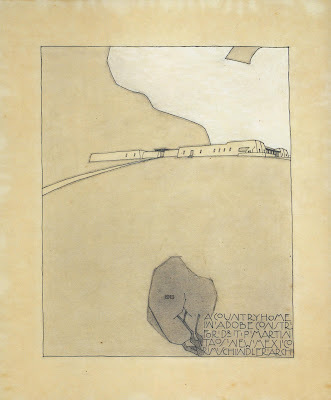 This beautiful drawing was done in 1915 by Rudolph Schindler, an architect in Taos, New Mexico. It was part of a proposal for an adobe home for a local doctor, Paul Martin. This is a museum quality drawing, but it was far too useful to hang in a museum. 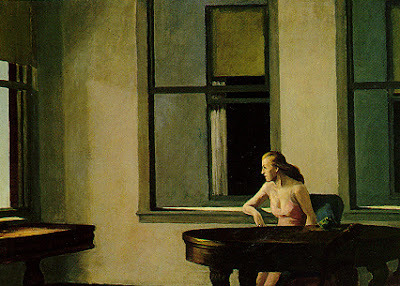 Edward Hopper loved to ride the elevated train through the city at night. 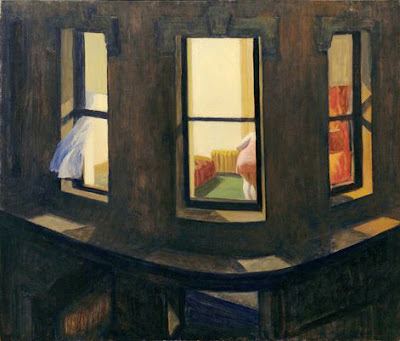 As the apartment buildings raced by in the dark, he would catch flashes of unearned intimacy: lonely people staring at the walls... desperate couples... people whose privacy was protected only by their anonymity. Sometimes I think that artists, like philosophers, are keyhole peepers at heart. They are observers, once-removed from the primacy of experience by the burden of consciousness. 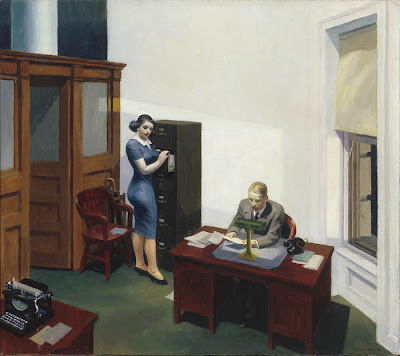 If Hopper lived today, he might get the same glimpses of humanity from Google. He could access an endless supply of private moments, intimate photographs, agonizing diary entries and personal confessions, efficiently organized and served up with the speed of an electrical pulse. He could download and catalogue them without ever leaving his chair. 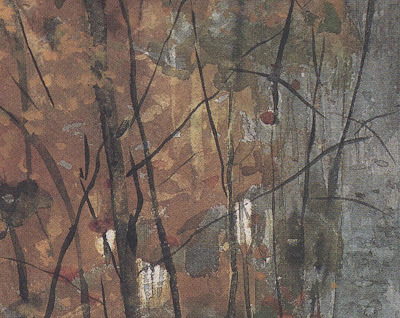 But art calls for a little less information and a little more rumination. Or, as Carl Sandburg said, poetry is "the opening and closing of a door, leaving those who look through to guess about what is seen during that moment." 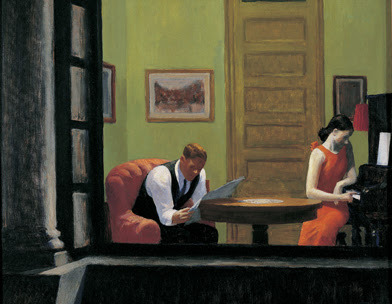 Hopper's fleeting views from the train left him plenty of time afterward for slow meditation. 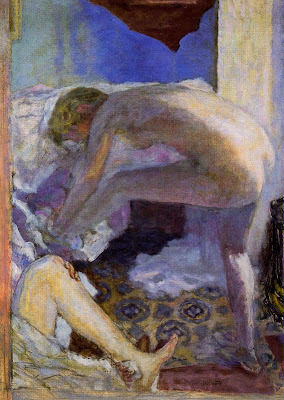 Perhaps that is how he was able to transform a glimpse of a naked human into a painting of naked humankind. There's only one thing that all art has in common: a frame. The frame may be made of metal or wood or it may be purely conceptual, but it is a perimeter that defines where the art ends and the rest of the world begins. 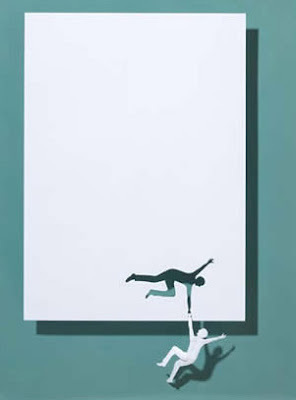 No matter how outlandish or varied the art is, no matter whether it is an antique painting or the latest performance art, it is always framed by a boundary that separates the art from the rest of the natural world. 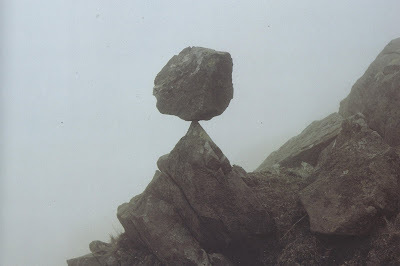 A few inches to the right or left of this sculpture there are rocks balanced on each other that are not art, but this one has became art because of the conceptual frame around it offered by Goldsworthy. Until we live in Dubuffet's utopia, the role of art will continue to depend in part on where we draw the frame . 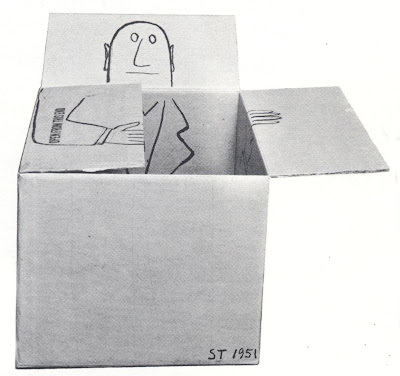 1964 was the beginning of an era of bold experimentation in the United States. 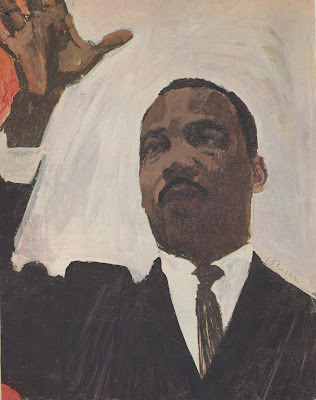 The Beatles and Bob Dylan were revolutionizing popular music; Martin Luther King won the Nobel prize as the civil rights movement gained momentum; humans were orbiting the earth and headed for the moon; Cassius Clay became the heavyweight champ and changed his name to Muhammad Ali; clothing and hair styles became adventurous; and all across America, students began protesting the war in Vietnam and experimenting with meditation or mind expanding psychedelic drugs. 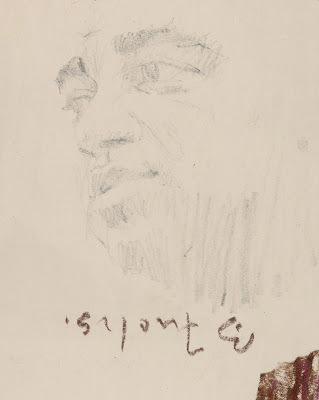 You can still see the traces of the original discarded drawing below his signature. The final version published in Look magazine was bolder still, a strikingly innovative work . 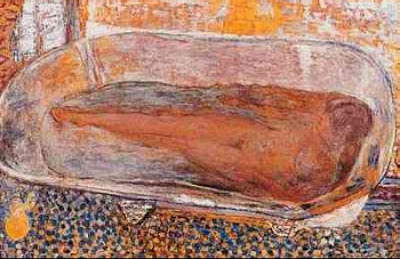 Pierre Bonnard was a part time law student and a part time painter. A man of diverse interests and little focus, he also considered a career as an interior decorator, or possibly a set designer. But mostly he enjoyed an active social life, spending much of his time at the theatre or chatting with friends at the cafes. 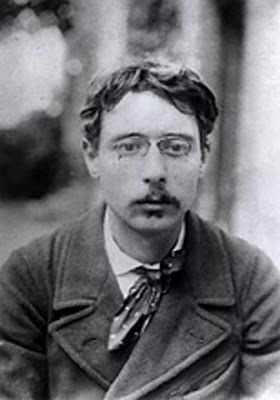 Then one day Pierre saw a striking young woman getting off a trolley. He followed her to a small shop where she worked stringing beads on wreaths. 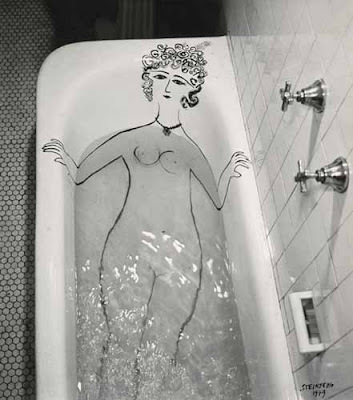 Friends later described Marthe de Moligny as a "washed out Ophelia type...unstable and eccentric and morose." 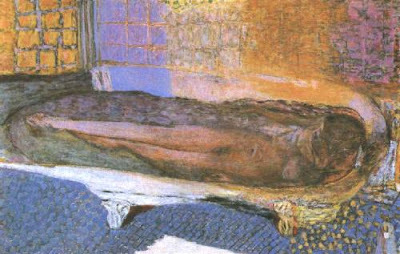 But Bonnard saw something special in her and persuaded her to leave the shop to become his model, his mistress, and ultimately his wife. Pierre and Marthe were two very different people. They quarreled bitterly at first. Pierre was unfaithful to Marthe. 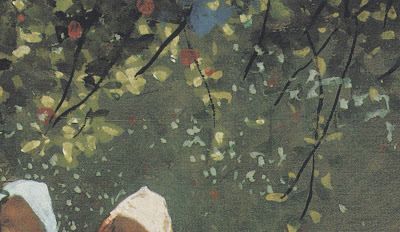 Marthe was melancholy, a reclusive hypochondriac and a scold. When Pierre invited his friends over, Marthe would slam the door in their faces. And yet, Pierre and Marthe held on, gradually working out their differences. Each surrendered the things that were less important to them. 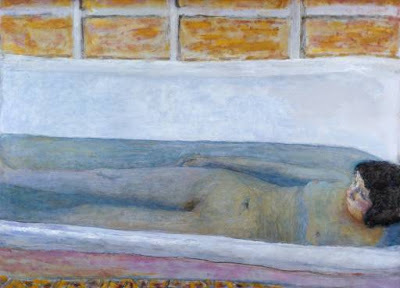 Bonnard gave up his mistress and his social life for the reclusive Marthe. They made a home together in a small apartment with almost no furniture. 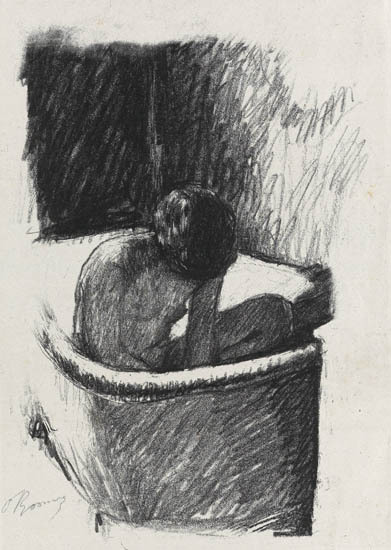 There, they retreated to their inner sanctum, the tiny bathroom where Marthe loved to take long baths every day while Pierre watched and painted her again and again. But it did not matter. 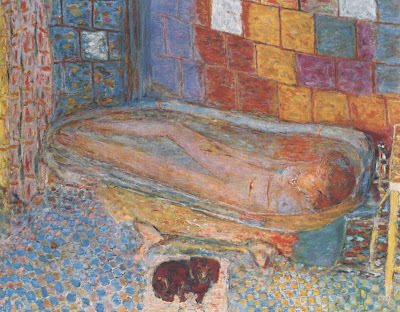 Bonnard had found his focus, and was on his way to becoming a great painter. The couple shed friends, entertainment and other distractions as they went deeper and deeper. As Norman MacLean once noted, Everything gets smaller on its way to becoming eternal. Pierre worked on one painting of Marthe in the bath for two years. Altogether he is reported to have made 384 pictures of her. The couple stayed together for 50 years, and when Marthe died Pierre was disconsolate. 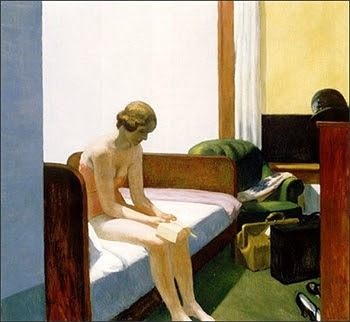 Marthe never cared much for material possessions, but she did covet a grand bathroom, one with windows and running hot water so she wouldn't have to heat water in a pan on the kitchen stove. 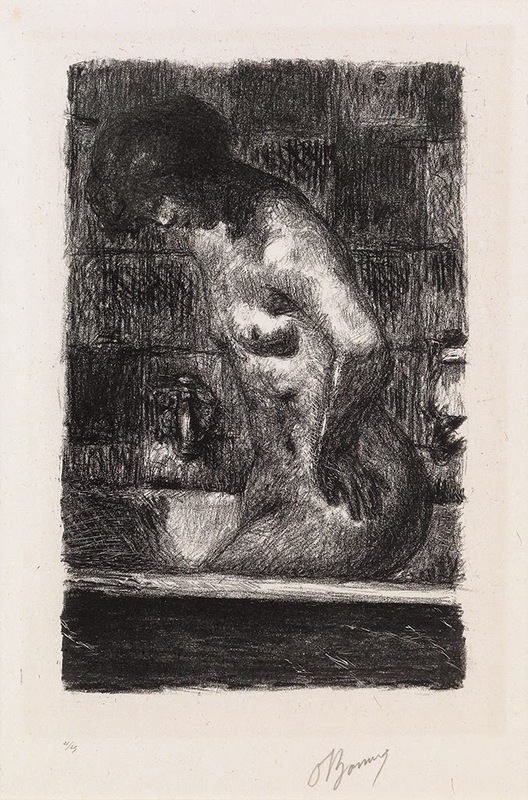 For most of her life, her bathroom had just an iron bathtub, cracked plaster and wooden floors. 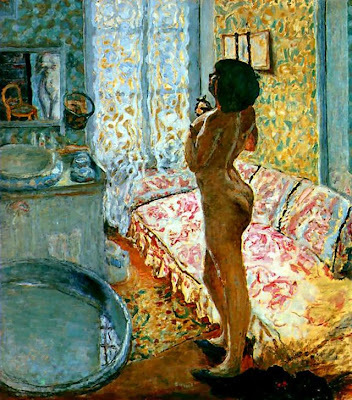 So I find it revealing that Pierre painted her bathroom as very large, with shimmering rainbows of color and beautiful tiles, mirrors, luxuriant towels and sunlight streaming through big windows. I imagine that's what he saw, and that's what he gave her. 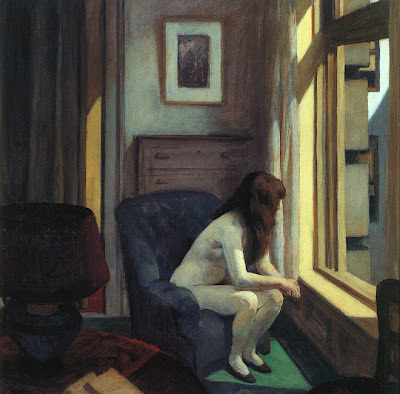 Habitualization devours works, clothes, furniture, one's wife... and art exists that one may recover the sensation of life; it exists to make one feel things.... The purpose of art is to impart the sensation of things as they are perceived and not as they are known. 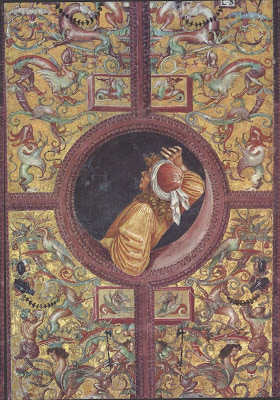 The technique of art is to make objects unfamiliar, to make forms difficult. 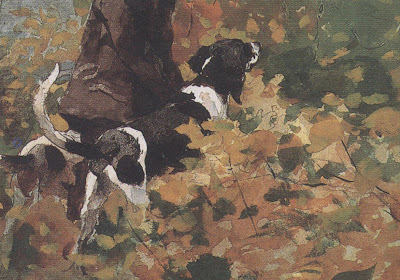 It's easy to understand what he means when you look at these brilliant pictures by illustrator and watercolorist Winslow Homer. 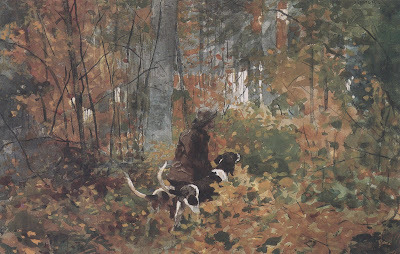 He has made commonplace objects unfamiliar, merging the patches of color on the dogs with the patches of color on the leaves. By showing us the abstract design in the world, Homer "increased the difficulty and length of our perception." Homer seems to say. 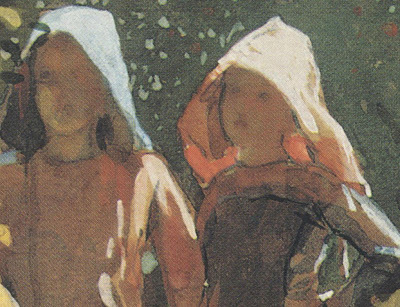 "Have you noticed the effect of the bonnets illuminated white from above and pink from behind? 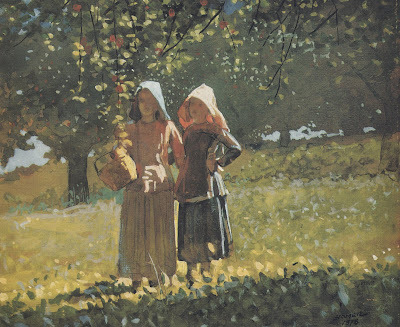 Or the shapes created by the dappled sunlight on their blouses?" These pictures make you realize the extent to which we stumble like sleepwalkers through a world of familiar sights.